The unique features and new technology used in the TDR1170 Time Domain Reflectometer makes it the most flexible and easiest to use cable fault locator accessory. The TDR 1170 features an automatic configuration, which can be modified as necessary. All cable fault data can be stored and retrieved at any time, ensuring time saving, consistency and accuracy from one crew to the next. The digital TDR1170 will locate and identify short circuit (bolted) faults, low resistance shunt faults, open circuits, high resistance series faults, wet sections, splices, transformers, cable transitions, and concentric neutral corrosion. 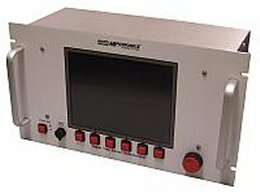 To locate high resistance, intermittent and flashover faults, the TDR 1170 is designed to measure in the digital arc reflection, current impulse, voltage decay, and all differential fault locating modes. The selection of fault location method allows the operator to select the method that they are most familiar with or the method that is most appropriate for the type of cable and type of fault that is encountered. The TDR 1170 requires a high voltage coupler to interface to a cable fault locator (thumper). The cable fault locator then provides the voltage and current to enable the TDR 1170 to quickly and definitively locate cable faults. Included with the TDR 1170 is a software package to allow the stored data to be viewed on a PC and also be printed and analyzed by personnel or by training teams. Easy to use Time Domain Reflectometer. Provides Long-Term Storage and Evaluation. Scope of Supply: One each, RG58/U BNC-BNC cable, Serial interface cable and input line cord, operators manual and TDR-PC interface software.